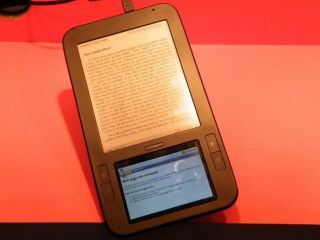 This eBook reader is notable because it runs Android and features a second colour screen. What's more, that means the touchscreen can be used to navigate the web or access email and media. You can also switch the book display to the bottom screen if it's dark. Manufacturer Spring Designs has partnered with Google Books (like Samsung with its new pair of readers) as well as Borders. Other formats including PDF are also supported. Price? $399 (£250).